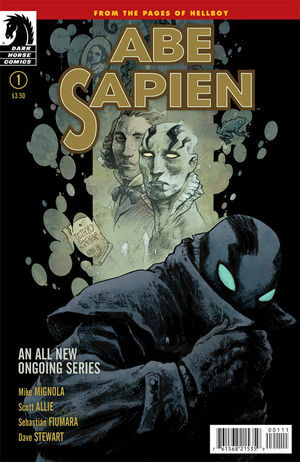 The Fellowship was fortunate enough to obtain a copy of ABE SAPIEN #1 from Dark Horse Comics. Mike Mignola and Scott Allie write, and Sebastian Fiumara draws. Abe has left the B.P.R.D. and they don’t know where he’s gone. Or why. Oh, they have a few vague ideas, but they’re also being distracted by some monster sightings. But Abe seems to be piecing some things together, possibly including his origin. The Bureau is pretty good at finding things, though, so Abe has to be on his toes. Abe Sapien got his own ongoing book! And for a first issue, this one does a nice job of setting up some potential storylines for down the road, which is always helpful. It looks like Abe will need to prove in this opening arc that he can function on his own, and this is a good start to that. Overcoming his appearance will be a good beginning, too. This is a good, open-ended first issue for a well-loved character. And I expect that it will turn out to be a good title for a long time to come. Get into it now while you can. ABE SAPIEN #1 is available now at your FLCS or by order at darkhorse.com.